Everyone thinks when Santa is coming to town it’s on his sleigh. Well it’s not so today. 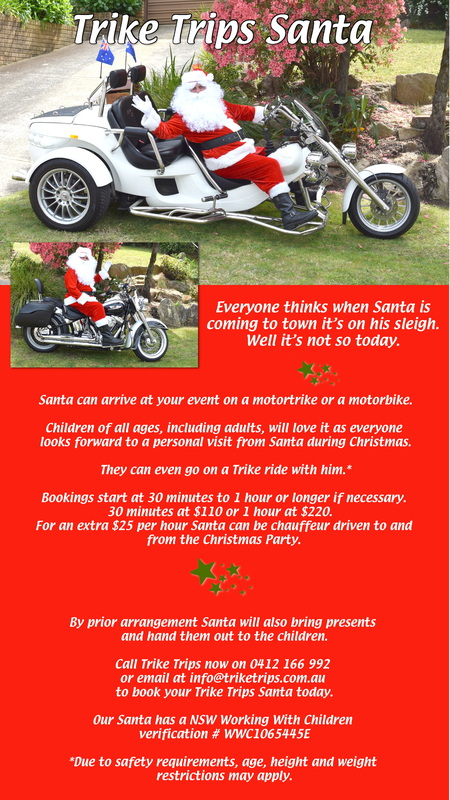 Santa can arrive at your event on a motortrike or a motorbike. Children of all ages, including adults, will love it as everyone looks forward to a personal visit from Santa during Christmas. Bookings start at 30 minutes to 1 hour or longer if necessary. 30 minutes at $110 or 1 hour at $220. For an extra $25 per hour Santa can be chauffeur driven to and from the Christmas Party. By prior arrangement Santa will also bring presents and hand them out to the children. *Due to safety requirements, age, height and weight restrictions may apply.